This resort enjoys a strategic setting in a tranquil location in the village of Batu Bulan. It lies some 5 km from the Bali Bird Park and the Batu Bulan bus station and is about 8 km from Sanur, with its beach and tourist centre. The village is in Sukawati District, near to Denpasar City (about 20 minutes' drive), Sukawati traditional art market (around 30 minutes by car) and Gianyar Regency, a popular place for arts and crafts as well as Barong dance performances. It is situated about 40 minutes' drive from Denpasar's Ngurah Rai International airport.The resort's 26 uniquely designed luxury villas lie secluded from the more crowded areas of Bali. Moreover, couples on honeymoon can rent a villa designed especially for them, which guarantees they can enjoy quality time celebrating the special occasion. 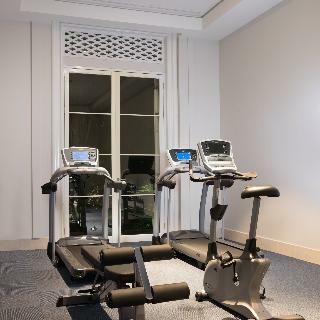 Facilities on offer at this air-conditioned establishment include a lobby area with a 24-hour check-out service, a hotel safe and a restaurant. Guests will appreciate the Internet access and can also take advantage of the room and laundry services. Parking is available for those arriving by car.Every building features a modern interior and Balinese architecture. Each has been designed by a different architect and interior designer and is based on a specific theme. All come with a private bathroom with a shower/bathtub and a hairdryer and offer a king-size or double bed. They are equipped with a direct dial telephone, satellite/cable TV, Internet access and a safe. They have a kitchen with a minibar and tea and coffee making facilities. Furthermore, individually regulated air conditioning and either a balcony or a terrace are provided in all accommodation units as standard.This resort features an outdoor swimming pool with sun loungers.Breakfast, lunch and dinner are available as a set menu. Located in Klungkung-Bali, overlooking lush green rice paddies and the serene blue water of exotic Lepang Beach, Wyndham Tamansari Jivva Resort is ideal for a relaxing escape, romantic getaway or family holiday. Only 45 minutes ride from Ngurah Rai International Airport, the newly built resort strategically locate the must - visit tourist destbation in Bali, include Bali Safari & Marine Park, Keta Gosa & Kamasan Village, Padang Bai, Candidasa, and Ubud. Not to forget that it is surrounded by world famous surf break point, such as Keramas Beach, Ketewel Beach, and Batu Klotok Beach. Breath in deep when you reach our Wyndham Tamansari Jivva resort and feel an unparraled sense of relaxation wash over you as you tour our resort ground for the first time. The resort is situated in-front of the world-famous Keramas right-hand reef break, a 25 minutes' drive from the arts and cultural centre of Bali, Ubud. 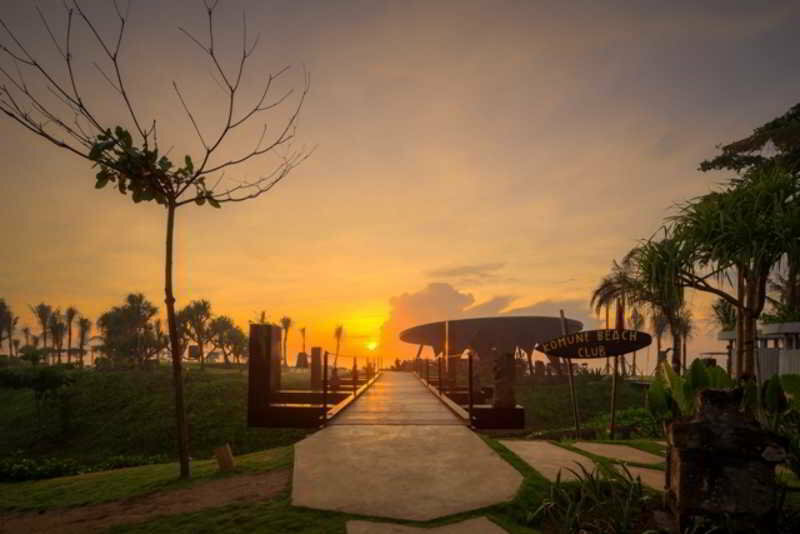 It also is a 45 minutes' drive from the Ngurah Rai international Airport in Denpasar. Guests who choose to stay at the resort will definitely appreciate the resort's great location fronting the world-class surf breaks, exotic design and a friendly community's spirited atmosphere. The property is dedicated to connecting adventurous, fun-loving, environmentally conscious travellers who share a passion for surfing and who enjoy the beach culture. 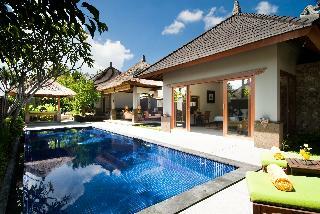 Bali Masari Villas & Spa is luxurious while close to nature. Situated about 3 km from the beach, and close to the village of Sukawati which is famous for its art market. The 12 spacious villas are on the side of the valley over-looking the Petanu River, offering a peaceful and picturesque Balinese landscape. The resort boasts its own spa with highly trained staff. If you want a peaceful and romantic place to either hang around and unwind, or act as a convenient base for daily adventures, Bali Masari provides a very attractive option. Welcome to Omah Apik; a “Beautiful Home” (Omah = Home; in Javanese Language and Apik = Beautiful, Tidy, Good, Good Heart; in Javanese, Sundanese, and Balinese Languages). We are a family run business, located off the main road in the neighborhood of Pejeng Village, just fifteen minutes East of Ubud Town, and amongst the rice fields in the foothills of Tampaksiring, Bali – Indonesia. Our Bed & Breakfast consists of eleven guest rooms, surrounded by a whole variety of indigenous fruits and coconut trees, as well as organically grown local flowers, vegetables, and herbs. The casual mix of Balinese, Javanese and Colonial Style of the Architecture and our Tropical Garden allows us to create an intimate and friendly environment for our guests to enjoy and relax within our compound on the edge of wide open rice fields.We are the Omah Apik family. Please make yourself at home here! This property is located just 10 km away from the centres of Gianyar and Denpasar. The property is conveniently situated just a 50 minutes' driving distance from Ngurah Rai International Airport. Guests will find themselves in the prime setting from which to explore this mesmerising area. This resort comprises beautifully-appointed thatched dwellings, which afford visitors a unique experience and insight into traditional Balinese life. The accommodation options are exquisitely designed, and come well equipped with modern amenities. 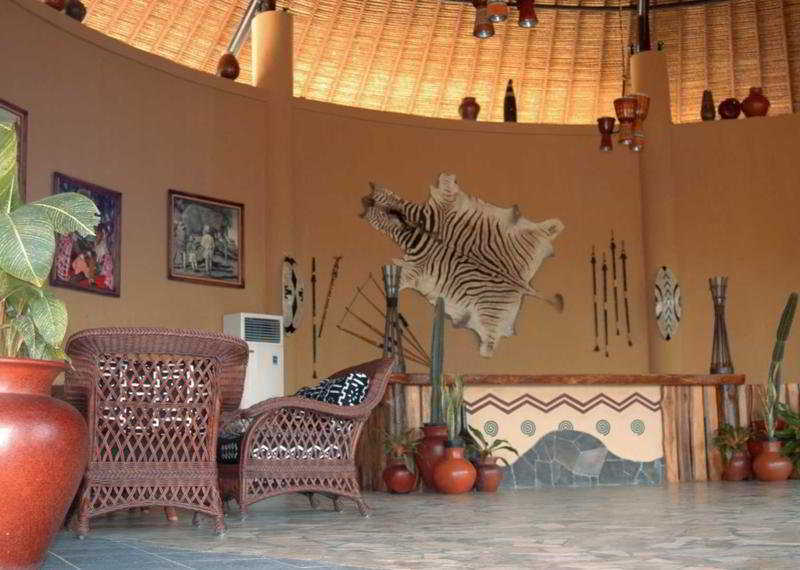 Guests will be impressed by the extensive array of facilities and services that this wonderful resort has to offer. Dedari Kriyamaha Villa, a heavenly Ubud villas is perched on a valley edge surrounded with panoramic rice terraced and coconut tree with amazing sunset setting where you can leave the crowds behind and recharge your energy in your own private refuge. Imagine opening the shutters every morning and taking in views of the tranquil outdoor living space. 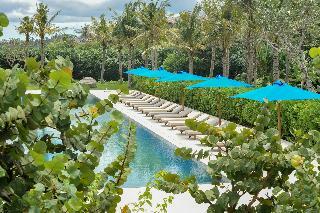 Spend the day lounging next to your private pool, or gazing at the stars from your terrace. You may even want to spoil yourself with a traditional balinese meal lovingly prepared by our chef.Located in Kendran Village is only ten minutes drive from Ubud center, an exotic destination for heritage, spiritual healing and culture holiday experience. At Dedari Kriyamaha Villas where the Intimacy created in the serene and beauty of heaven on Earth. The Royal Purnama Bali exclusive boutique retreat for sophisticated travellers over-12-years-of-age, is supported by impeccable service, luxurious facilities, and the beauty and tranquillity of a rural oceanfront setting in southeast Bali in Sukawati, Gianyar. The Royal Purnama Art Suites and Villas, Bali is situated oceanfront beside the majestic Pantai Purnama (Full Moon Beach) on the southeast coast of Bali, in Sukawati, Gianyar. Just 15km from Sanur and 16km from Ubud. The setting is both beautiful and tranquil, with lush plantations on one side and the glittering black crystal sands of the beach on the other. The resort is the ideal choice for honeymooners and couples alike. Whatever travellers plan to do on their holiday here, be sure that the nice resort will do its best to accommodate travellers` needs, in an atmosphere of exquisite beauty and service surrounded by nature. The resort also can arrange wedding packages for those wishing to get married in Bali, rooms for meeting and other events.At Ramah Luwih, travellers have the beach, the lake, and the mountains right at their fingertips, making the envy of many hotels in Bali. 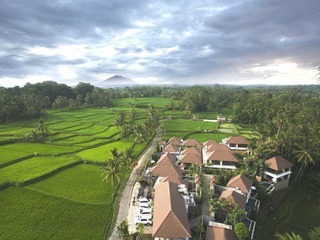 The resort located in Gianyar just 30 minutes north of Sanur, ideal for those seeking to escape the crowds. We are also ideally positioned to visit Ubud and beautiful destinations in East coast of Bali such as Candidasa, Amed, Sidemen and Klungkung. We offer complimentary shuttle services to both Sanur and Ubud for hotel guests. This is a new luxury boutique resort by the sea on a 4-hectare property that comes right to the edge of a beautiful black-sand beach. The 360-degree view includes the Indian Ocean and the neighboring island Nusa Penida, broad rice fields, and the holy volcano Mount Agung. All villas have private pools and unrestricted views to the sea. The newest in the collection of Komaneka Resorts boutique hotels, Komaneka at Keramas Beach is designed in a contemporary style inspired by Balinese architecture, with fine woods and luxurious interiors. There is a generous use of space throughout the resort. A delightful culinary experience in a spectacular environment awaits guests at the Timur Kitchen restaurant, where the savory cuisine is prepared with the finest fresh ingredients, some from the resort's own rice fields and organic gardens. There is also a beachside swimming pool, spa and fitness. No additional charges, no card fees. Best price guaranteed. Dedicated, multilingual customer services department. We are part of Hotelbeds, with over 20 years experience and more than 30 million customers worldwide. 300,000+ opinions from our travellers on 94,000+ hotels and suites.